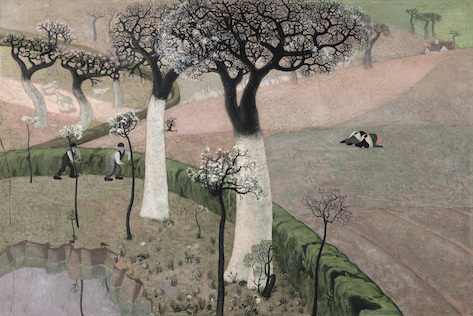 On paper, OER is an exhibition about Flemish art between roughly 1880 and 1930, with in the leading roles: Emile Claus, Valerius De Saedeleer, Gustave Van de Woestyne, George Minne, James Ensor, Léon Spilliaert, Rik Wouters, Frits Van den Berghe, Constant Permeke, Gust. De Smet, Hubert Malfait and Edgard Tytgat. But OER is much more. ROOTED takes a fresh look at one of the major turning points in the art history of Flanders, from around 1880 to 1930. OER offers an extraordinary selection of masterpieces by the most influential painters of this period. Most of the works are privately owned and are being shown to the general public for the first time. Add a fabulous scenography, which makes it seem as if you’re walking around in the paintings, and you know: OER is an exhibition not to be missed. The exhibition will run at the Provinciaal Cultuurcentrum Caermersklooster from 15 March 2017 to 6 August 2017. Courtesy Galerij Oscar De Vos.